It’s Heroes Day today, a public holiday when we are supposed to remember those who died in the liberation struggle for Zimbabwe. This is nothing unusual; the war dead are remembered in various ways all over the world. At the time of the so called liberation struggle I was in the Rhodesian Army and did not see those against whom I was fighting as liberating anything. That could just be a point of view I guess – one man’s terrorist is another’s freedom fighter and all that. Except for the fact that over the years a number of the ruling party faithful have been interred in Hero’s Acre (the national cemetery) who status as heroes are dubious. Others who should have been buried there were left out. There is a certain financial incentive to being a national hero in that the family remaining get a substantial pension. Anyway, like I said, today is the day that Zimbabweans are supposed to remember the fallen. There are celebrations all over the place and earlier this week I had a request from a local farmer for donations towards the party to be held today on his farm where the local branch of ZANU-PF, the ruling party, has its office. I ignored it, after all, they are not my heroes. I was hoping to be able to tell him this in person but aside from two missed calls yesterday morning from a local number that I did not recognise, nothing has come to pass. Yet. Seedlings of course don’t take holidays so this morning I went into work to see how things were going. Fine of course. It was also an opportunity to catch up on a bit of work as I will be away for 3 weeks at a horticultural congress in Brisbane, Australia. 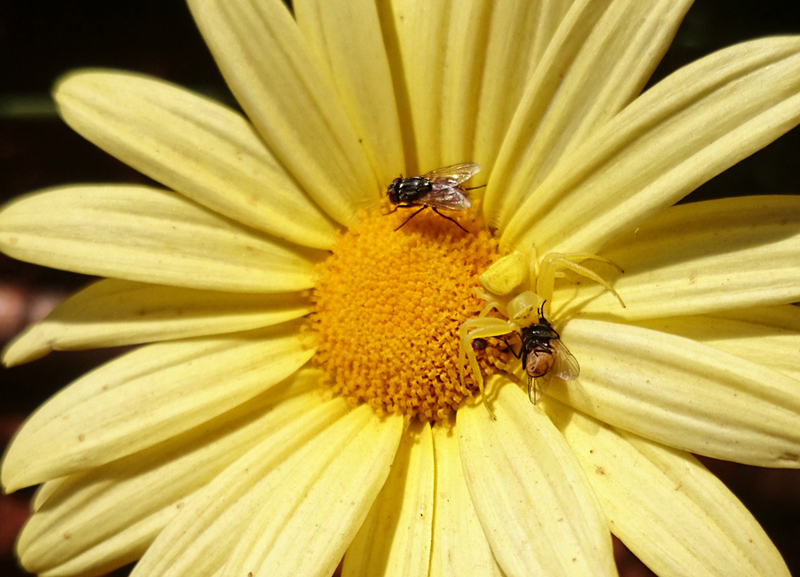 It was worth it on another count as I spotted this spider on a daisy. I have seen this type of spider on cosmos and it was white to match the flower. I wonder if they have the ability to change colour depending on the background or they have to spend their life on the plant to get the right colour? It was pure luck to see it with a fly as when I took the first photo it was just patiently waiting. Of course I didn’t have my big SLR with its very special macro lens so my cellphone had to do – I was quite impressed with the result. Tomorrow is another public holiday – this one is Armed Forces Day. It is traditional for the president to address the crowds at the National Stadium just outside town and watch military parades and a flypast by the Air Force with the 4 lonely remaining fast jets that are still flying. There is a football match afterwards to help pull in the crowds. Whether the armed forces will be celebrating remains to be seen. Rumours are rife that they have not been paid and junior officers have been sent on forced leave to cut costs. So who are my heroes? They are the firefighters who went back into the damaged reactor at Chernobyl, knowing full well that they would not survive. They are the firefighters who went into the Twin Towers after the 9/11 attacks knowing that they were going into a hideously dangerous situation because that was their job. They are those who work for MSF and the International Red Cross and without fanfare get on with the thankless task of helping Ebola victims (and others) survive. These are the people I admire. Do spiders go to heaven? This was not a happy spider when I found her yesterday. Look at the legs – the way they are all curled forward. They do that when the end is nigh (or are dead) and sure enough this morning, when I opened the drawer where I’d left her overnight, she was dead. She could move a bit when I found her, legs curled, on the floor of the bathroom. I moved her into some sunlight to take the photo and she didn’t try to move off. I wondered what the problem was. Old age? Parasites? It certainly wasn’t anything that had been sprayed as nothing had. She appeared to be in her prime – zoom in and marvel at those fangs and hairy coat! I cannot think what would eat a spider around here. 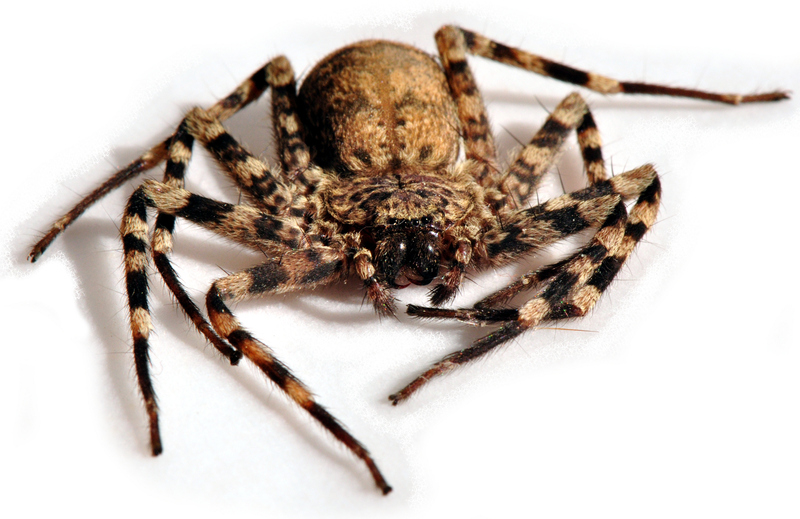 It’s not actually spider season right now as it’s too dry to support much in the way of insects. That will change in the rains when the bathroom becomes a favorite habitat of mosquitoes. So even if spiders don’t go to heaven my bathroom will become a heaven for those of them still around. And yes, my house is a bit of a spider haven; I rather like them!